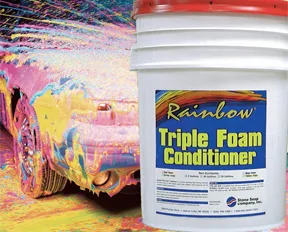 Stone Soap’s Rainbow Triple Foam, with durable carnauba and silicone additives, has been improved for even greater customer appeal. Its wild berry fragrance was made stronger, and its colors intensified to produce deeper red, blue, yellow, and green foam. The brightly colored foam is pH adjusted for easy rinsing with either low or high pressure, and is safe to use with any reclaim system. It is ideal for conveyor, in-bay automatic, and self-service washes and is available in 5-, 15-, 30-, and 55-gallon containers.